Much of what is known about technological innovation and progress has yet to be captured in discussions of climate change mitigation. Successful mitigation of climate change is not about finding "a solution," but developing appropriate institutional and policy options for technological innovation – options that allow experimentation and progress on multiple fronts, tolerate risk, accept that there will be both successes and failures, and focus on creating the initial conditions for progress. Like other aspects of U.S. energy and climate policy, the nation’s approach to energy-climate innovation has lacked a clear mission and strategy. Most attention and discussion has focused on advanced research, yet most innovation in the coming decades will depend much less on frontier research than on other available and proven tools. (Indeed, in none of our workshops did “more research” surface as the major concern—not even for air capture, which, though radical in concept, is based on well-understood concepts and processes.) We know what works, based on the past 60 years and more of experience, but so far we have not used what we know to address energy technologies and climate change. We know, for example, that technological advances come largely from industry—but that government can catalyze, and even create, new waves of industrial innovation by supporting the technology base, providing incentives (such as those that have been so effective in expanding the market for PV systems), and deploying its purchasing power. By treating climate mitigation as a public good and GHG reduction as a public works endeavor, the United States can rapidly strengthen the linkages between public investment and private sector innovation, and begin to lead other countries toward building energy-climate technologies into the fabric of their innovation systems, their economies, and their societies. Has Steve McIntyre Found Something Really Important? A commenter here asks me to discuss recent goings on over at Climate Audit, where Steve McIntyre thinks he is on to something rather important. I've followed Steve's work for years, and I think I have a pretty good sense of what he is up to and why it might matter for climate science and the nexus of science and political debate. And if you don't know what this is about, good luck catching up to speed (but if you want to try, there will be no better place than Bishop Hill's recounting). Such is the complexity of the issue and its history. But let me say this: If Steve has indeed come across new information that forces a significant re-evaluation of a major branch of climate science, then there is no excuse for this not to appear in the peer-reviewed scientific literature. I think that Steve can easily separate out the quantitative implications of his work from the messy science-politics part. If Steve has discovered a smoking gun, then I'd expect Nature and Science to both be candidate publications. And I would really hope that some of those members of the relevant expert community who (I know) frequent his blog would join with him, perhaps as co-authors, to help bring the new analysis into the mainstream scientific discussion. That is how science moves forward. Meantime, all we have is some interesting analyses and speculation on a well-read and thoughtful blog. I'm happy to wait and see what develops, and to let Steve get on with his work in progress. The climate bill coming this week from Sens. Barbara Boxer and John Kerry will likely leave some big questions unanswered, including the biggest: how to divvy up carbon allowances. Allowances are permission slips to release emissions, and they function as a currency in the market the cap-and-trade legislation would create. For Boxer (D-Calif.) and Kerry (D-Mass. ), they are chits to use to negotiate support for their bill as they attempt to form a winning coalition. How are those "chits" being used? The draft is also expected to have “placeholders” for some additional subsidies for coal and nuclear power. . . Most energy lobbyists expect the bill to pass Boxer’s committee but not get much further this year. That would give President Barack Obama some progress on climate to show off in Copenhagen, Denmark, where world leaders will discuss what to do about global warming, but leave a final push in the Senate for early 2010. Several Democratic senators are already on record as being uneasy about the climate bill. The distribution of the allowances is one way to ease those concerns. Some sectors, namely the oil and gas industry, feel like they weren’t treated fairly under the allowance system Waxman and Markey eventually settled on. Jack Gerard, the president and CEO of the American Petroleum Institute, said the sector was seeking more “equitable” treatment. Refiners got 2 percent of the allowances to cover emissions at their own facilities. But the sector is also responsible for the emissions that come from the use of their products — in total, around 44 percent emitted by human activity in the United States. The Institute is flying in Hispanic workers this week as part of its grassroots push to change its image from that of the corporate fat cat. The group was preceded by a group of women and African-Americans who work in the industry, and will lobby on taxes and access issues beyond climate. “We want to show the human face of the oil and gas industry in the United States,” Gerard said. Solar and wind each provide 20% of total electricity supply; nuclear capacity is tripled, and the technology for coal plant carbon capture and sequestration (CCS) is assumed to be available without constraint. Geothermal provides 100 GWe (compared with about 2 GWe today). Reliability issues stemming from the heavy dependence on intermittent wind and solar energy resources are assumed to be resolved with economic electricity storage and other advanced grid technologies that are not available today. Hydroelectric plants continue to contribute at their current, relatively modest level. These are generally very ambitious goals. Some observers would likely regard them as being at or even beyond the bounds of plausibility. with its highly optimistic assumptions about the future availability of renewables, nuclear, and CCS, the mid-century carbon emission reduction goal could only be achieved if the annual growth in GDP per capita between now and 2050 were to slow to a rate of 1% per year. It is worth noting that in no decade since the 1930s has this broad measure of the nation’s economic growth performance been as low. Wind accounts for 15% of total electricity supply, and solar another 5% – both many times larger than their current contributions, but well below today’s most optimistic projections. No new nuclear plants are built, and all currently operating plants are phased out. Carbon capture and sequestration technology is assumed not to become available, and no new coal plants are built. The balance of electricity supply is provided by a combination of hydroelectricity (unchanged from today), geothermal (100 GWe), and biofuels. What are the implications for economic growth in the context of the reduction target?
. . . per capita economic output would actually have to contract[by 0.85% per year] in order to achieve the mid-century carbon emission reduction goal. Uncompromising environmental advocates assert that the risks of climate change are so great that carbon emission reductions must be achieved regardless of what this would mean for economic growth. But that view is not widely shared and as a practical matter national policy is unlikely to privilege the emission reduction goal in this way. Certainly many people would regard the prospect of weak or even negative economic growth in the service of avoiding global climate change as unacceptable. But it is an inescapable fact that even with extraordinary measures to adopt low-carbon energy supply technologies on a large scale it will be mathematically impossible for the country to enjoy even moderate economic growth in the absence of much stronger energy efficiency gains than in the past. Equally, strong economic growth will be impossible even with rapid gains in energy efficiency if these are not accompanied by much more aggressive rates of decarbonization. Remarkably, in all that I have read and heard in the public debate on Waxman-Markey and its Sentae follow-on, aside from a few academic papers and discussions, the phrase "rate of decarbonization" is all but absent from the debate. In its place we see plenty of discussion of "allocation of emissions allowances." This fact alone is a clear sign that politics is trumping policy in the U.S. climate bill. No one should be surprised if rates of decarbonization are not substantially influenced by the legislation, if it ever passes, which right now looks questionable. However, so long as climate policy is focused on magical solutions the fact that "rate of decarbonization" isn't considered to be important will probably not trouble too many people in the debate. Climate Policy Can Decrease Tropical Cyclone Disasters? It is silly season for climate policy debate. UN FCCC Chief Yvo de Boer points to flooding in the Philippines from Tropical Storm Ketsana and says that an agreement in December can reduce such disasters. Apparently no one has told him that global tropical cyclones are at a 30-year low. "Time is not just pressing, it has almost run out," said UN climate head Yvo de Boer, who broke down in tears of frustration at talks in Bali two years ago, when world governments drew up the "road map" to the Copenhagen deadline. After two years of haggling, the world is still trying to thrash out a draft text for December's talks, with major disagreements on the two key issues of cutting carbon emissions and meeting the associated costs. "There is no plan B, and if we do not realise plan A the future will hold us to account for it," de Boer said in his opening speech to around 2,500 government delegates and representatives from business and environment groups. De Boer said that devastating floods in the Philippines at the weekend which have killed at least 140 people further highlighted the need for action. "One of the reasons why countries have gathered here is to ensure the frequency and severity of those kinds of extreme weather events decreases as a result of ambitious climate change policy," de Boer said. Maue observes that " the number of tropical cyclones with intensity greater than 34-knots has remained at the 30-year average (83 storms per year)." So it is hard to understand de Boer's invocation of Tropical Storm Ketsana as a reason for an agreement on emissions other than a crass effort to exploit some political advantage from the misfortune of those who suffered tragedy this week, such as those pictured above. Professor John Schellnhuber, of the Potsdam Institute for Climate Impact Research in Germany, said the US was "climate illiterate" and that the rest of the world may be forced to agree a new deal without it. "Nobody should dream of the possibility that numbers and targets for countries will be sealed in Copenhagen," said Schellnhuber, one of the world's foremost climate scientists. "If the US doesn't move then nothing will happen." He added: "The US in a sense is climate illiterate. It is a deeper problem in the US, if you look at global polls about what the public knows about climate change. Even in Brazil and China, you have more people who know the problem, who think that deep cuts in emissions are needed." He predicted that it could be several years before the US would be willing to take on carbon cuts that were ambitious enough to persuade countries such as China to set targets of their own. At UN talks last week, China and India made small steps forward on this issue, but Obama was unable to do the same. "The political chances seem very slim that something will happen in Copenhagen and even in the years after," he said. "Maybe in the conferences following Copenhagen some countries – including China and the EU – whatever the US does, will say: we go ahead now. Why can't we save the world without the US? Why should that not happen?" The US has by some distance the largest carbon emissions per capita in the world, and any deal without it would be significantly less effective at curbing global temperature rise. Speaking on the fringes of a climate science conference at Oxford University today, Schellnhuber said the former US president, George Bush, was to blame for a decade of inaction on climate change, and that many in the Republican party and the wider US population still did not understand the need to act. European nations and others have been waiting for President Obama to engage with the issue in a way that Bush refused to. I don't know what 'cap and trade' means. I don't think the average American does. This is not a cap-and-trade bill, it's a pollution reduction bill. In the absence of government action, the private sector will increase emissions up to the point where there is no further marginal benefit. That is, emissions will rise to whatever level is implied by profit-maximization, paying no attention to the effects on the environment. Krugman is making a case for limiting emissions, and that argument is pretty solid accordng to basic economic theory. But he goes too far when he says that because a case for reducing emissions makes sense, it necessarily means that cap-and-trade makes sense. The problem with cap and trade lies not in economic theory, but in political realities. Cap and trade cannot work in the real world -- Krugman's means cannot achieve the ends he seeks. He just assumes policy success, which is easy to do in theoretical arguments, but pretty far from the real world where we actually have to live with the policies that emerge from the messy legislative process. If cap and trade cannot work, then it would be logical that we should be exploring other means to reducing emissions. But instead, Krugman tries to shut down any discussion of alternative approaches by saying that if you don't accept his means, then you must not accept his ends. Krugman is ironically contributing the the very policy failure he seeks to avoid. Nothing like some messy facts to trouble an elegant theory. In an op-ed in the Washington Post today, Bjorn Lomborg summarizes parts of my Mamizu Climate Policy paper on Japan's emissions reductions targets (here in PDF). [Note to Bjorn, it is appropriate to acknowledge sources, even in an op-ed.] In this op-ed Lomborg is defending coal, or attacking those who wish to decarbonize, or defending free trade . . . or something. A few weeks ago Lomborg was championing geoengineering, this week he is defending coal. If climate policy is to be about more than symbolic exhortation, then it will necessary for goals to be more than aspirational. Japan’s Mamizu climate policy targets for 2020 and 2050 announced in mid-2009 were exceedingly ambitious, and if they are to be criticized, it should be for being too aggressive, not too weak. Should Japan actually succeed with respect to a short-term target of the magnitude implied by the Mamizu climate policy, then it will have achieved a carbon intensity of its economy lower than that of France in 2006 by the end of the decade, representing a decrease in emissions per unit of GDP of about 33%. If the world economy were to be as carbon efficient as implied by Japan’s 2020 target, then global carbon dioxide emissions in 2006 would have been only 40% of their actual value. Regardless of the nature of changes to the composition of the Japanese government in the future, there is considerable merit in encouraging Japan to actively seek to achieve its Mamizu climate policy because its successes and shortfalls will provide a valuable body of experience to other countries seeking to achieve similar goals. Should Japan choose to depart from its proposed Mamizu climate policy to one based on (even more) impossible targets and timetables than they may find themselves the subject of international applause rather than condemnation. At the same time such a shift would signify a desire to meet the symbolic needs of international climate politics while sacrificing the practical challenge of decarbonization policy. Conventional approaches to climate policy have thus far borne little fruit, but that is a topic that goes well beyond this brief analysis. Diversity in climate policy should be encouraged. As I argued in the similar case of Jim Hansen in 2006, EPA's actions to limit Carlin's ability to have input are simply put, incredibly stupid, for the exact same reasons that NASA's actions under the Bush Administration to try to muzzle Hansen were also incredibly stupid. Dr. Carlin remains on the job and free to talk to the news media, and since the furor his comments on the finding have been posted on the E.P.A.’s Web site. Further, his supervisor, Al McGartland, also a career employee of the agency, received a reprimand in July for the way he had handled Dr. Carlin. . . Dr. McGartland was “counseled” by his superior “to assure that professional differences are expressed in appropriate and considered ways,” according to one of the newly released documents. Kudos to EPA and the Obama Administration for focusing on the integrity of process. Barack Obama has talked down the importance of sealing a global deal on climate change before the end of the year, world leaders said yesterday.Obama's comments, made in private talks at the G20 summit, downplay the need to reach a strong deal at UN talks in Copenhagen in December and contradict the United Nations and others, who have billed the meeting as a crucial moment for the world to avoid catastrophic global warming. The president did win a partial victory on his signature climate issue at this G20 summit – removing fossil fuel subsidies – but there was no headway on the much bigger issue of climate finance, which Obama had taken up as his issue at the last G20. Air capture is an industrial process that captures CO2 from ambient air, producing a pure CO2 stream for use or disposal . . . Near-term development of air capture only makes sense if it can be realized at a sufficiently low cost. . . Air capture is neither a silver bullet nor a hopeless dream: It is simply another chemical engineering technology. Disputes about cost can only be resolved by developing a few air capture technologies to the point where they can be independently evaluated. Costs cannot be understood until specific processes are developed to a far greater technical depth than has been achieved to date. As with other energy technologies, it is not possible to determine the cost through small-scale university research alone. Instead, costs will only become evident with pilot-scale process development and when costing can be performed by contract engineering firms with relevant expertise. There are no government funding programs that specifically target the development of air capture, and I estimate that the total annual expenditure for these efforts is currently less than $3 million per year, of which more than half is private. A more substantial investment of government R&D funding is warranted for at least three reasons. First, early estimates suggest that air capture will be competitive with technologies that are getting large R&D investments. For example, the cost of cutting CO2 emissions by displacing carbon-intensive electricity production with roof-mounted solar photovoltaic panels can easily exceed $500 per ton of CO2. Yet even skeptics (10) suggest that a straightforward combination of existing process technologies could probably achieve air capture at lower cost. And the fact that several groups have raised private money for commercialization suggests that there are investors who believe that it is possible to develop technologies to capture CO2 from air at costs closer to $100 than $500 per ton of CO2. Second, air capture offers one route to make carbon-neutral hydrocarbon fuels (CNHCs) for vehicles by using captured CO2 to make synthetic fuels. Deep reductions in emissions from the transportation sector will require a change in vehicle fuel. Each of the three leading alternative fuel options—electricity, biofuels, and hydrogen—faces technical and economic hurdles that preclude major near-term reductions in transportation emissions. CNHCs represent a fourth, fundamentally different alternative: a method for converting primary energy from carbon-free sources such as solar or nuclear power into high–energy-density vehicle fuels compatible with the current vehicle fleet. It is unclear whether CNHCs will be competitive with the three leading alternatives, but they are promising enough to warrant R&D support on a par with efforts aimed at advancing the alternatives (20). Finally, air capture allows negative global CO2 emissions. Although this is a distant prospect, it is important because it represents one of the few ways to remediate human impact on the carbon cycle, an impact that is otherwise all but irreversible. Air capture may or may not contribute to efforts to stabilize greenhouse gas concentrations. But so long as scientists and policy makers frame climate policy as in terms of stabilizing concentrations of atmospheric carbon dioxide, then given current indications of its potential effectiveness and cost, air capture deserves to be among the options receiving attention in the international climate policy debate. President Barack Obama is drawing up a 'Plan B' to regulate greenhouse gases if the US Senate fails to pass legislation needed to mandate the new administration to negotiate an international climate treaty at crunch talks in December, a senior official said yesterday (24 September). Stopping in Brussels on a European speaking tour, Dennis Leaf, a senior adviser at the US Environmental Protection Agency (EPA), sought to ease European fears that the US will not be ready to sign up to a successor to the Kyoto Protocol if the Senate does not pass domestic climate legislation, including a cap-and-trade scheme, ahead of Copenhagen. The climate bill got through the House of Representatives in June, but only by a very narrow margin. Indeed, a repeat of the majority achieved in the lower chamber would not see the law through the Senate, where 60 out of 100 votes are required for approval. "The president wants comprehensive legislation, but at the same time there's a back-up plan," Leaf said. The US official noted that overarching legislation is the best way to reduce emissions considering the wide range of interests involved, from agriculture to energy and the environment. But he added that as a plan B, the president is setting up a regulatory system that will allow the US to regulate greenhouse gases under the existing Clean Air Act. UPDATE: Nicholas Stern's spokesman, Bob Ward, shows up in the comments. Have a look. Nicholas Stern, of the UK Stern Review Report fame/infamy, has published a paper outlining a "new" approach to climate policy (here in PDF). I put "new" in quotes because Lord Stern has adopted many on the most important recommendations that my colleagues and I have been making for several years now. But make no mistake, the approach outlined by Stern is his new paper is a radical departure from that which he espoused following publication of the Stern Review and much more (though not entirely) consistent with the recommendations that I and my colleagues have been making for several years now. Thus we propose an approach of using absolute numbers rather than framing targets as a percentage reduction on a particular base year. Absolute numbers are preferable to percentages for two reasons: they allow us to keep a check on the basic arithmetic of the targets (so that they ‘add up’) and they avoid having to argue a theoretical reference baseline for percentages. This of course was one of the core recommendations of Pielke, Wigley and Green (2008). If these emission targets are to be met without affecting the ambitions for growth in developing countries, it is evident that the emission intensity of output will need to change drastically over the next decades. This is a clear and fundamental conclusion from what we might call the ‘brutal arithmetic’. If we want to achieve both the strong emissions targets and the desires for growth then simple arithmetical logic requires a large fall in emissions per unit of output. In other words we must break the link between emissions and output. . . unless the USA, EU/Japan, Indonesia/Brazil and China reduce emissions per unit of output by a factor of 4 over the next 20 years, it will not be possible to grow at the desired rates and to reach the emission goals that sensible risk management requires. . . It is important to notice that the targets I have just described, and the implications they have in terms of reductions in emission intensity, have nothing to do with equity: they are just simple arithmetic based on what the science tells us on risk. All of these concepts and ideas can be found in Prins et al. (2009), among other places. Prins is on the LSE faculty with Stern, so it would be no surprise to see fertile ideas taking root. Whether Stern was actually inspired by these earlier works is less important that the fact that it seems that a more realistic approach to climate policy is taking hold in the mind of one of the issues most influential public intellectuals. And that is the best news on climate policy I've seen in a while. It’s important, then, to understand that claims of immense economic damage from climate legislation are as bogus, in their own way, as climate-change denial. Saving the planet won’t come free (although the early stages of conservation actually might). But it won’t cost all that much either. . . So here’s the bottom line: The claim that climate legislation will kill the economy deserves the same disdain as the claim that global warming is a hoax. The truth about the economics of climate change is that it’s relatively easy being green. I can do disdain also -- It is easy, it won't cost much. Right. Italian Prime Minister Silvio Berlusconi has written to the European Commission asking to renegotiate the caps on his country's carbon dioxide emissions, an Italian government official said on Thursday. The official made the comments one day after Poland and Estonia made headway in a court challenge to their own emissions caps. "The cap assigned to Italy was excessively low and we have difficulty meeting it as our industry is already very efficient, especially our power generation system," the official said. "The letter was meant to raise a problem that has also become evident in the European Court of Justice decision on Poland and Estonia's caps," the official added. "We are making no proposal, just looking to discuss this problem with the Commission." Over at Greenwire, Anne C. Mulkern has written a superb article demonstrating how a reporter can can use a "news" story to editorialize, advocate and attack a position that s/he personally disagrees with. It should be required reading for anyone wanting to learn how to editorialize through news stories. The subject of Mulkern's attack is The Breakthrough Institute (disclaimer: where I am a Senior Fellow) and the reason for the attack appears to be to generally discredit a recent analysis that shows that emissions allowances in the Waxman-Markey Bill are overallocated, a substantive point that is unimpeachable, even in the article. Maybe Mulkern has other issues with The Breakthrough Institute beyond this. But there were immediate questions about the study's credibility and the motivations behind it.
. . . he had not looked at the Breakthrough Institute's analysis and said he did not immediately have time to study it. Some Democrats and environmentalists distrust the Oakland, Calif.-based institute because of its contrarian positions. "The Breakthrough Institute keeps coming out with these pointless reports attacking Waxman-Markey," said Joe Romm, senior fellow at the Center for American Progress, a think tank headed by John Podesta, who was chief of staff to former President Clinton. "Waxman-Markey is kinda old news. The Senate is constructing a bill now." "I'm confident that the smart senators and people who write this bill will fix it," . . .
"One assumes the people who write the final bill will use the new [emissions] numbers, and then the problem goes away,"
In other words, the BTI analysis is pointless because the House legislation is old news and its problems will be fixed. So, according to Romm the analysis is in fact right, its just that the Senate will tighten everything up by presumably reducing allowances and eliminating the vast overallocation of offsets. So why talk about problems in legislation since everyone knows that they will be fixed? Right, that makes sense. Jenkins said Romm has criticized Breakthrough Institute studies in the past but has not statistically discredited them, even though the institute provides the data, calculations and assumptions it uses. Jenkins did the analysis for the institute. He does not have a background in economics. "It's not an economic analysis," Jenkins said. "It's based on the economic forecasts of the EIA and CBO. Beyond that, it's relatively simple arithmetic that any old competent policy analyst such as myself is capable of." "Everything claims to be a new analysis," Romm said. "It's a new analysis that they glommed from me." Use innuendo to impeach the credibility . . . attack the man . . . and then if there is any lingering doubt show that the analysis, even if correct, is not new anyway . . . and allow someone to claim that it was in fact stolen from their own work. By the way, beyond the drama, The Breakthrough analysis is excellent, if I were Joe Romm I'd be taking credit for it as well. You can read it here. The bottom line is that even reporters with an agenda cannot hide the fact that climate policy is in disarray. Taking it out on people who are proving to have been systematically correct now for quite a while won't change that fact. But it will tell us something about certain folks in the media, and the challenges facing those trying to navigate a third way on climate policy. Akihiro Sawa of the 21st Century Public Policy Institute, a think tank in Japan, has written an interesting paper on the new Japanese government's (the DPJ) proposed climate policies. The paper also has some interestingt views on how the United States is viewed in Japan. The paper has just been translated into English as is available here in PDF. The DPJ has forgotten (or perhaps, are not aware?) that many major developing countries appreciated Prime Minister Taro Aso‟s genuine “clear water” target of reducing 15% compared with 2005 levels (which would be achieved solely by domestic efforts, not employing overseas credits, or offsets), and that these countries have also criticized the EU for including offsets and other developed countries such as Australia for “cheating.” Councilor Fukushima mentioned the possibility that “the 25% target may not be a "clear water" target.” If this is true, Japan may have disappointed South Africa and Bangladesh, which were supportive of Japan‟s “clear water target” as a criterion proving the sincerity of its reduction efforts, and government authorities of China and India, which have been critical of the excessive use of offsets by developed economies. We would hope that a leader of government charged with severe international negotiations would be more prudent of what he says, as any statement he makes, even domestically, is bound to eventually reach all governments via their embassies. Perhaps the DPJ's intention was to impress developing countries by setting out the 25% reduction initiative as a sign of Japan‟s enthusiasm towards large reductions. However, at the current global negotiation table, developing countries led by China and India are not ready to give up their demands for reductions in developed economies by 40-80％ - far beyond 25%. Although Councilor Fukuyama mentioned that reduction efforts are meaningless without the participation of China and India, saying that the government would “strongly urge” their involvement, it is hard to conceive that two countries which have maintained a hard-line stance so far in global negotiations, which are not always based on good intentions, would be so easily “urged” to assume a reduction target. They are, however, very likely to escalate their demands, applauding Japan's competence - its unprecedented declaration of a high reduction target exceeding the capacity of all other countries and its positive outlook that the more stringent the target is, the more innovation is promoted, and hence a stronger economy. They would suggest that in order to accelerate economic recovery, Japan might seek an even higher target which would fulfill their demands of reductions by 40% or more. Would the DPJ be ready to accommodate such demands? Or, would they respond that 40% would be impossible even in their best efforts? If so, what makes 25% a viable figure, and 40%, not? If in turn, China and India should insist on a 40% reduction target as a nonnegotiable condition for their involvement, would the DPJ assent to the 40% reduction target alone, regardless of US and EU resistance? If not, the DPJ would leave developing countries in great despair. The major problem with the 25% reduction initiative is that it was announced without any diplomatic strategies to convince developing countries to abandon their severe demands and has unnecessarily raised their expectations. With this strategy in mind, we can only imagine the US‟s dismay over the sudden announcement of a new 25% reduction initiative benchmarking 1990, instead of 2005, coming from Japan, with which it had kept close ties, after its painstaking efforts to make EU consent to the new baseline year. Just when an integrated diplomatic strategy was about to be maintained among developed countries including the EU, against unreasonable demands from developing countries, Japan‟s introduction of its 25% reduction initiative could break ranks. EU acclaimed the 25% reduction initiative, not to anyone's surprise; Japan has in effect become the first to offer to be a buyer of excess credits generated in a sectoral crediting mechanism (a scheme in which developing economies that have committed to a intensity-based target or other numerical target are issued credits for achieving their goal but suffer no penalties in non-compliance), EU's dole out scheme for developing country involvement. For scrambling players of the money game, who will enjoying large profits from transactions in a crediting (emissions trading) scheme, any country that sets out targets that are absolutely impossible to achieve are not only valued clients who will purchase emission allowances but also an important source of market information on price forecasts. Do read the whole ting, here in PDF. Every once in a while amid Joe Romm's name-calling and doomsaying, he says a bit too much. In this case Chip Knappenberger takes Joe to task for offering up a very weak bet on future global temperature change for the 2010s. Remarkably, the terms of Joe's bet fall below the range projected by 87% of the IPCC models, indicating that Joe thinks that the IPCC has overestimated warming, which is inconsistent with Joe's frequent statements to the contrary. Nothing like some numbers to cut through the verbiage. So, instead of [Joe Romm] offering up something on the namby-pamby side of things (which seems to run counter to his character), he ought to put something strong and confident out on the table—at least a bet that the 2010s will minimally average 0.25°C above the past decade’s average temperature, but even more impressive would be 0.30° or 0.35°C. Come to think of it, if he really believes the “doubled” warming projections from the MIT study that his is so keen on touting, he ought to man-up and proffer a 0.50°C average temperature rise during the next decade as a reasonable 50-50 value. That would certainly cement his reputation as a true believer. Offering anything less, would indicate that Joe really isn’t all that convinced that global warming is going to progress at rate leading to “unmitigated catastrophe.” Offering to bet on a 0.15°C rise is more like something I would put up (if I were the betting sort)! So is Romm a closet “lukewarmer?” Or is he starting to become a bit worried that global warming is being a bit overblown? He has already reversed course to endorse a very weak climate bill (Waxman-Markey, what James Hansen called a “monstrosity”) as “the only game in town.” Perhaps he is unwittenly softening his physical science view as reality too. So here’s a challenge to Joe (‘I’m-right-you’re-wrong’) Romm: will you offer a global warming alarmism bet instead of a ‘global lukewarming’ one? Will you walk your scary talk? Romm has painted himself into a corner (and not for the first time). Will he escape with silence or bluster? Or will he actually walk his talk? The climate corner of the blogosphere awaits his monumental decision. Meantime, it is just a bit embarassing to be caught out as being so inconsistent. Pielke, Jr., R. A., 2007. Future Economic Damage from Tropical Cyclones: Sensitivities to Societal and Climate Changes, Philosophical Transactions of the Royal Society, Vol. 365, No. 1860, pp. 1-13. Last month a group of German authors, including several associated with Munich Re, published a discussion paper online that replicated this analysis, confirming its results. The paper, by Silvio Schmidt, Claudia Kemfert and Eberhard Faust adopts a similar approach to that which I used, which was simply to assume that tropical cyclones will become more intense in the future, and then compare the expected damage from that intensity increase with the effects of projected societal change. As I found in Pielke (2007), they also found that societal factors are overwhelmingly dominant in coming years, even assuming a direct and significant relationship of greenhouse gas emissions and tropical cyclone intensity and under a range of socio-economic scenarios. They find that about 90% of the increase in losses to 2015 and 96% to 2050 will be due to societal factors even when assuming a greenhouse gas effect on tropical cyclones. In other words, assuming a direct greenhouse gas-tropical cyclone link, reducing greenhouse gas emissions such that they have no effect addresses a maximum of only 4% of the increased losses in 2050, under the assumptions of the study. Obviously therefore, damage from tropical cyclones is primarily an issue of adaptation to climate, not mitigation. Interestingly, they find in their literature review that the only studies that quantitatively compare the expected costs of human-caused climate change on tropical cyclones with the effects of societal change are the two studies that I have conducted. Schmidt et al. 2009 is thus the third. While I do have some quibbles (e.g., their study focuses on the U.S. and mine is global), I am happy to report that their results are entirely consistent with my own. Schmidt and colleagues have replicated other work that I have done on hurricanes and I welcome this confirmatory work. Silvio Schmidt, Claudia Kemfert and Eberhard Faust, 2009. Simulation of Economic Losses from Tropical Cyclones in the Years 2015 and 2050 – The Effects of Anthropogenic Climate Change and Growing Wealth, DIW Berlin, German Institute for Economic Research, August. You can find a pre-publication version of my new paper on Japan's climate policy here in PDF which is soon to appear in Environmental Research Letters. My recent analysis of the UK Climate Change Act can be found here. And stay tuned for a similar analysis of Australia's proposed ETS, which I'll post up very soon. This paper evaluates Japan’s so-called “Mamizu” climate policies proposed in mid-2009 in terms of the implied rates of decarbonization of the Japanese economy for short-term and long-term targets. The paper uses the Kaya Identity to structure the evaluation, employing both a bottom-up approach (based on projections of future Japanese population, economic growth, and technology) as well as a top-down approach (deriving implied rates of decarbonization consistent with the targets and various rates of economic growth). Both approaches indicate that the Japanese economy would have to achieve rates of decarbonization of 2.6% to meet a 2020 target of reducing emissions by 15% below 2005 levels, and 5.0% to meet a 2050 target of an 80% reduction below 2005 levels. A target of 25% below 1990 emissions proposed by the opposition party (which subsequently formed a government following elections in August 2009) implies a rate of decarbonization of 4.6% annually to 2020. The paper argues that international criticism of Japanese Mamizu climate policy proposals as being too weak was unfounded, and if anything, the proposals may have been too ambitious. In either case, climate policy would be strengthened through the support of a diversity of approaches to decarbonization. Pielke, Jr., R.A., 2009 (accepted). Mamizu Climate Policy: An Evaluation of Japanese Carbon Emissions Reduction Targets, Environmental Research Letters (PDF). In 2006, Poland and Estonia submitted their emissions plans for the years 2008 to 2012 to the commission. Poland gave itself an overall target of 285 million tons of carbon dioxide per year, while Estonia set itself a target of 24 million tons. Arguing that it needed to account for future economic growth, Poland's self-imposed target was more than 40 million tons higher than its total industrial emissions in 2006. Estonia's target was almost double its 2006 emissions. In 2007, the commission ruled that the plans did not fulfil the potential for emissions cuts, and ordered Poland to curb its emissions by more than a quarter, and Estonia by nearly half. That decision has now been overturned by the EU court. . . The EU court must also decide on similar cases involving Bulgaria, Romania, Latvia, Lithuania, and the Czech Republic, effectively calling into question the way the entire system is run and potentially undermining the price of emissions permits across Europe. Absent a world government, the ruling should make clear that which should already be obvious -- there is no global set of institutions capable of overseeing any sort of interlocking, multi-national cap-and-trade programs. If it can't work in the EU it certainly won't work in the UN. So long as emissions are tightly coupled to GDP, then no country is going to cede authority over its economy to any other country by giving them any say over their emissions. If and when the link of GDP and emissions is broken, then such international coordination might be possible (as has been the case in say transboundary air pollution or ozone depleting chemicals, neither of which is at all coupled to national GDPs). But note the direction of causality -- technological innovation happens first, coordinated global governance second. Climate policies should thus be focused on breaking the link between GDP and emissions, which means a coordinated, international approach to technological innovation (i.e., specifically improving efficiency and reducing carbon intensity of energy supply). Considering the country already has reduced its economy’s energy intensity by 20 percent over the past five years, the shift to carbon intensity with a meaningful goal attached “would be significant and impressive,” says Reid Detchon, vice president for energy and climate at the United Nations Foundation in Washington. China appears to be making steady progress toward its goal of achieving a 20-percent reduction in energy intensity by 2010. "This suite of policies [alluded to today at the UN] will take China to be the world leader on addressing climate change," he said. De Boer told reporters: "It will be quite ironic to hear that tomorrow expressed in a country (the United States) that is firmly convinced that China is doing nothing to address climate change." But such claims -- and there are many these days -- are made with absolutely no reference to data, so I decided to have a look. Getting data on China's economy and energy use can be tricky, so I have relied on two reliable sources, the BP Statistical Energy Review for energy consumption and the IMF for GDP. I used GDP expressed in constant national currency because the 11th Five-Year Plan of the Chinese government expressed its GDP numbers in terms of market exchange rates and not in terms of PPP. The plan seeks to reduce energy intensity of GDP by 20% from a 2005 baseline. Energy intensity is thus energy consumption divded by GDP. 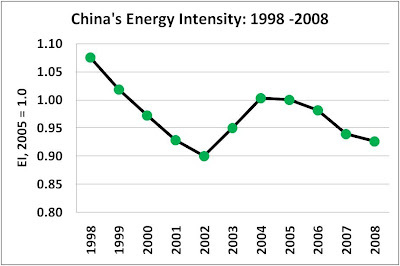 The graph below shows Chinese energy intensity for the period 1998 to 2008, with 2005 (the Plan's base year) set to 1.0. A few things stand out. One is that China's energy intensity in 2008 is about the same as it was in 2001. Any claim that China's energy intensity has improved by 20% over the past five years is incorrect. The second is that energy intensity has improved by only about 7.4% since 2005, meaning that it has a long way to go to reach a 20% target by 2010 (i.e., 0.80 on this graph). Can it happen? Sure. But to say that China is "well on its way" does not square with the data. It would be "ironic" indeed if China has figured out how to grow its economy at 9% per year while increasing energy use by only 3% and decarbonizing its economy at an even lower amount. If this were true, then China would have discovered the holy grail of emissions reductions and we can all forget about the challenges of climate policy. With all of the talk of China now being the "world leader" on emissions reductions, is this story just another myth of climate policy? It sure looks that way. Environment Minister Sakihito Ozawa said Sunday that Japan's new goal for cutting greenhouse gas emissions will put the country in a strong position at international negotiations on climate change. But details of how the government will achieve the ambitious goal of reducing emissions by 25 percent from 1990 levels by 2020 has yet to be crafted within the new government, Ozawa admitted. If climate policy is to be about more than symbolic exhortation, then it will necessary for goals to be more than aspirational. Japan’s Mamizu climate policy targets for 2020 and 2050 announced in mid-2009 were exceedingly ambitious, and if they are to be criticized, it should be for being too aggressive, not too weak. Should Japan actually succeed with respect to its short-term target then it will have achieved a carbon intensity of its economy lower than that of France in 2006 by the end of the decade, representing a decrease in emissions per unit of GDP of about 33%. If the world economy were to be as carbon efficient as implied by Japan’s 2020 target, then global carbon dioxide emissions in 2006 would have been only 40% of their actual value. Regardless of the nature of changes to the composition of the Japanese government in coming months and years, there is considerable merit in encouraging Japan to actively seek to achieve its Mamizu climate policy because its successes and shortfalls will provide a valuable body of experience to other countries seeking to achieve similar goals. Should Japan choose to depart from its proposed Mamizu climate policy to one based on (even more) impossible targets and timetables than they may find themselves the subject of international applause rather than condemnation. At the same time such a shift would signify a desire to meet the symbolic needs of international climate politics while sacrificing the practical challenge of decarbonization policy. Conventional approaches to climate policy have thus far borne little fruit, but that is a topic that goes well beyond this brief analysis. Diversity in climate policy should be encouraged. Pielke, Jr., R.A., 2009 (provisionally accepted). Mamizu Climate Policy: An Evaluation of Japanese Carbon Emissions Reduction Targets, Environmental Research Letters. Over his 45 years, Siddique Ur-Rahman, a Bangladeshi rice farmer, has watched as his world has been gradually swallowed by water. During his youth his family cultivated 7.2 acres along the Kholpotua river, a waterway then so narrow that villagers standing on one bank could call across to those on the other side. But as the riverbed silted up, the waters rose and spread, submerging vast swathes of low-lying paddy land, including Mr Rahman’s family’s fields. New data shows that Bangladesh’s landmass is increasing, contradicting forecasts that the South Asian nation will be under the waves by the end of the century, experts say. Today, Mr Rahman and 73 other shell-shocked families from Lebu Bunia live on the narrow finger of the embankment’s remains, as do nearly 1m other Aila survivors. Twice each day at high tide, water rushes over their ruined lands – making it impossible for them to rebuild their homes. Each month at full moon the water rises so high it almost engulfs the embankment. Lebu Bunia – with its ruined lands and desperate survivors – offers an alarming glimpse into a possible future if the international community fails to agree a meaningful plan to tackle global warming in the coming months. 1. The situation in Lebu Bunia is not an "alarming glimpse into a possible future" -- it is an "alarming glimpse into a very real present." The people who are suffering the impacts of sedimentation in Bangladesh are actually real people experiencing real suffering today. However, in the climate debate they are reduced to mere symbols in the need to address energy policies in order to reduce the suffering of future generations. Surely we should act to prevent suffering in the distant future, but in this instance, as is typical in discussion of adaptation, nothing much is said about helping those suffering today. Atiq Rahman, executive director of the Bangladesh Centre for Advanced Studies, warns that rising sea levels and accelerated glacier melt from global warming could lead to about 17 per cent of Bangladesh’s land area – home to about 35m people – being permanently submerged in the coming decades. That could trigger a migration of unprecedented magnitude – with explosive social consequences – in the Indian subcontinent and beyond. “Millions of people will be moving. No amount of nuclear submarines will be able to stop that,” warns Mr Rahman, who was also a member of the Intergovernmental Panel on Climate Change, which won the Nobel peace prize in 2007 for its work on climate change. This is just nonsense. What does the data actually say? Maminul Haque Sarker, head of the department at the government-owned centre that looks at boundary changes, told AFP sediment which travelled down the big Himalayan rivers — the Ganges and the Brahmaputra — had caused the landmass to increase. . .
“Satellite images dating back to 1973 and old maps earlier than that show some 1,000 square kilometres of land have risen from the sea,” Sarker said. Far from losing land, Bangladesh has been gaining net land in recent decades due to sedimentation. But even if Bangladesh was being swallowed by a rising sea, could an international agreement in the coming months change the course of sea level rise over "coming decades"? Analyses of the effects of mitigation policies are absolutely clear on this point -- No, it could not. On the question of attribution and effect, can anyone provide a reference to a peer-reviewed study that indicates that if the international community agrees to a meaningful plan to tackle global warming in the coming months that it will have any effect whatsoever on sea levels (Bangladeshi or otherwise) in "coming decades"? I don't think so. Setting aside questions of science, the climate debate has in many ways lost touch with reality from a policy perspective. If the world wants to help poor Bangladeshi rice farmers who live in vulnerable locations, then we know how to do that. Using the poor suffering today as poster-children for mitigation policies seems exploitive and even immoral. Addressing accumulating carbon dioxide in the atmosphere makes good sense, as I've often argued, but promising fantasy outcomes -- like arresting rising seas on a time scale of decades -- is pure fiction. But maybe the climate debate is so important that exploiting poor people and making stuff up is perfectly OK. Only "deniers" would say differently, no? It is all for a just cause, right? Expect more incoherence on adaptation as the debate gets even more intense in the coming months. Claudia Kemfert and Roger Pielke, Jr.
Bjorn Lomborg is famously known as the “sceptical environmentalist“ after the title of his widely debated 2001 book of the same title. Since then, he has been working with economists to identify the most effective strategies for bettering human welfare by applying cost-benefit analysis to a portfolio of possible policy options. Lomborg’s most recent effort asks, if we spent $250 billion on climate policy, how should we spend it to be most effective? The two of us were among a group of international experts asked to propose and critique a number of policy options, such as avoiding methane emissions, improving forestry practices, increased spending for energy technology innovation and researching solar radiation management, a form of geoengineering. The work of these experts was then presented to a panel of distinguished economists, including three Nobel Prize winners, for a final ranking of policy options in response to climate change. Surprisingly (to us at least), geoengineering research was identified as the number one priority in the list of most efficient climate policy options while policies to put a price on carbon appeared dead last. While we applaud the effort of Copenhagen Consensus Centre to raise debates about how to prioritize finite resources on challenging global problems, we take issue with the results. It can be a very useful exercise to systematically go about ranking policy options, both to identify what those options are, and how they might compare. Cost-benefit analysis has its critics (us among them) but with an understanding of the methodologies strengths and weaknesses can contribute to more effective policy making. However, in the case of the Copenhagen Consensus on Climate Change, we think that Bjorn Lomborg and his distinguished economists have muddled rather than clarified discussion of climate policy options, for at least three reasons. First, to suggest that geoengineering research has a high potential payoff is no different than saying that research into fusion energy has a potential high payoff, or for that matter, so too would research into how to turn atmospheric carbon into diamonds. The problem is, just as with fusion or more far-fetched options, geoengineering is almost universally viewed as being severely limited as a practical policy response to accumulating carbon dioxide in the atmosphere. While we support continued research into geoengineering (as well as into fusion) we believe the prospects for such research to result in solutions to accumulating carbon dioxide in the atmosphere to be vastly overstated by the Copenhagen Consensus. Second, policies focused on putting a price on carbon faired poorly in the exercise. A carbon tax – at any level – was ranked dead last by the experts, while emissions trading did not even make the list. Oddly, the second highest ranked option – focused on clean energy innovation and deployment – was presented to the panel of economists as being accompanied by a low but growing carbon tax, as part of the proposed policy design. Yet, Lomborg's panel of economists chose to cite the need for innovation and ignore the carbon tax. The two of us disagree about how best to price carbon, with one of us favoring carbon trading across countries and trace gases, while the other favors a low carbon tax to finance clean energy innovation. However, we strongly agree that putting a price on carbon is a necessary component in any portfolio of policies designed to decarbonize the global economy. Third, with respect to adaptation, the results of the Copenhagen Consensus on Climate Change arrived at results contrary to the broader Copenhagen Consensus exercise on the world’s most challenging problems. The broader exercise, which has been conducted several times now, consistently ranks as the most effective investments policies focused on addressing disease and malnutrition, which could save the lives of millions of people around the world. Such policies would also have the effect of making people, especially in poor countries, much less vulnerable to climate change. Yet, in the current exercise on climate change the economists ranked policies focused on reducing vulnerability below geoengineering and other research and only as a “good” investment. Perhaps this says something about the fickleness of economists and their tools, but also about the structure of the Copenhagen Consensus exercise. So what can we learn from the Copenhagen Consensus analysis? It is indeed worthwhile to discuss and debate policy options on climate change. However, a simplistic ordering of options obscures the fact that efforts to foster clean energy innovation and deployment, to reduce vulnerabilities to climate variability and change, and to conduct research must all go forward at once. These policies are not trade-offs with one another but complements that also overlap with other pressing problems such as expanding energy supply, development and fundamental research into the climate system. Unfortunately, the Copenhagen Consensus on Climate Change has obscured these complexities and thus offers little in the way of practical advice to decision makers grappling with the challenges of climate policy. China will be at the forefront of combating climate change by 2020 if it meets government targets on reducing greenhouse gas emissions, the International Energy Agency suggests. The finding contrasts sharply with the widespread image internationally of China as a country of inefficient, carbon-intensive industry that is resisting international calls to curb its emissions. China’s strong showing in curbing emissions will make negotiations on a new global agreement on climate change easier. The assumptions of spontaneous decarbonization in the Chinese emissions paths are yet another example of "magical solutions" on climate policy. With China's emissions growing at 12.2% per year during the present decade, it is inconceivable that this rate will somehow drop to 3.4% per year to 2020, much less the 1.8% or 0.9% per year implied by the low growth scenarios. Doesn't the FT ever interview anyone for an alternative point of view? The recession has resulted in an unparalleled fall in greenhouse gas emissions, providing a "unique opportunity" to move the world away from high carbon growth, an International Energy Agency study has found. In the first big study of the impact of the recession on climate change, the IEA found that CO 2 emissions from burning fossil fuels had undergone "a significant decline" this year - further than in any year in the last 40. The fall will exceed the drop in the 1981 recession that followed the oil crisis. The graph above shows annual rates of decarbonization of the global economy from 1981 to 2006 (blue bars, using data from Maddison and EIA) and then data for 2008 (red bar) from The World Bank and a German group for carbon dioxide emissions (data for 2007 is not shown). We should have a bit of caution in using two datasets, however, because I am looking at percentage changes rather than absolute values for decarbonization, if the data is accurate then the comparsion should be OK. 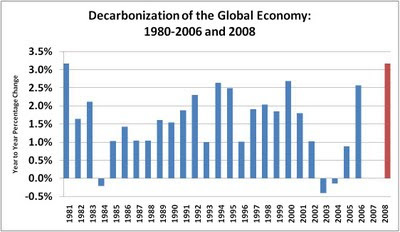 The graph shows that the world did indeed accelerate its decarbonization at a rapid rate in 1981, in fact at almost exactly the same amount as in 2008. But then after 1981 the world resumed decarbonization at a much lower rate. The magnitude of emissions decline was larger in 2008 than 1981 for the simple reason that the baseline (and the economy) is much larger. Fatih Birol, chief IEA economist, said the  fall was "surprising" and would make it "much less difficult" to achieve the emissions reductions scientists say are needed to avoid dangerous global warming. "We have a new situation, with the changes in energy demand and the postponement of many energy investments," he said. "But this only has meaning if we can make use of this unique window of opportunity. [That means] a deal in Copenhagen." I am afraid that Mr. Birol is kidding himself if he thinks that the 2008 recession will make future emissions reductions efforts "much less difficult." In fact, because the recent recession likely led to the plucking of much "low-hanging fruit" in the global energy economy, it would not be surprising to see rates of decarbonization much lower than 2008 starting in 2009. Why should we believe that 2008 different is any different than 1981? Ms. Hedegaard would also like fast-developing countries like India and — especially — China to commit in some way to limiting their emissions, noting that by 2020 two-thirds of emissions will come from countries now considered developing nations. I don't think that a "tough luck for you" argument will play so well in Beijing and New Delhi. It is wholly a confusion of ideas to suppose that the economical use of fuel is equivalent to a diminished consumption. The very contrary is the truth. As a rule, new modes of economy will lead to an increase of consumption according to a principle recognised in many parallel instances. . .
Now the same principles apply, with even greater force and distinctness, to the use of such a general agent as coal. It is the very economy of its use which leads to its extensive consumption. It has been so in the past, and it will be so in the future. Nor is it difficult to see how this paradox arises. . .
And if economy in the past has been the main source of our progress and growing consumption of coal, the same effect will follow from the same cause in the future. Economy multiplies the value and efficiency of our chief material; it indefinitely increases our wealth and means of subsistence, and leads to an extension of our population, works, and commerce, which is gratifying in the present, but must lead to an earlier end. Economical inventions are what I should look forward to as likely to continue our rate of increasing consumption. Some people have suggested that Jevons Paradox means that efforts to become more efficient are misguided. Others, seeing such arguments being made have tried to claim that Jevons Paradox actually does not exist. Both lines of argument are badly misguided. Jevons Paradox is very real. It tells us that increasing efficiency is necessary if we are to met energy needs, because those energy needs will continue to grow even in the face of rapid growth in efficiency. Thus, the practical consequences of the paradox are that we need to become more efficient and we need more energy, all at once. How efficient we can become will of course influence the amount of energy that we need, so improving efficiency is a worthy goal. But no one should imagine that efficiency gains alone can eliminate the need for more energy -- they can't and they won't. Policy needs to be able to focus on advancing efficiencies and creating ever greater sources of energy. “It is suggested that the U.S. Senate may not, after all, deal with the climate change issue until next year, when the UN Conference on Climate Change in Copenhagen is over and the delegates have gone home. If this were to happen, it would open the United States to the charge that it does not take its international commitments seriously, and that these commitments will always take second place to domestic politics. The United States is just one of the 190 countries coming to this Conference. But the United States emits 25 percent of all the greenhouse gases that the Conference is trying to reduce. Is the U.S. Senate really expecting all the other countries to make a serious effort on climate change at the Copenhagen Conference in the absence of a clear commitment from the United States? I don't think that statements like this are going to go over well in the U.S. -- either in Congress among both parties, or in Congressional districts. The statements may even be what we call in the U.S. "bulletin board material." Update: Thanks to reader Sharon F. for the link explaining the allusion in the title: will it play in Peoria? Time for a "Plan B"? A day after Senate Majority Leader Harry Reid (D-Nev.) hinted that climate legislation might be postponed until 2010, some analysts wondered whether that actually could mean 2011. Or perhaps that it wouldn't be considered in the Senate at all. With congressional midterm elections looming next year, they say the timetable is limited for politicians to act on a major bill before partisan rancor dominates Capitol Hill. That is raising speculation that lawmakers and the Obama administration may go for a "Plan B" next year that involves passage of a general energy bill without its most complex climate elements. 'Plan A' for the United Nations climate-change conference in Copenhagen is an ambitious new global agreement to replace the ageing Kyoto treaty. But most signs point to disaster. Negotiators are grappling with issues more complex than practically any others in international diplomacy. Their progress has been so slow that the most recent round of climate talks, held last month in Bonn, Germany, ended with strident calls to work harder and faster. In reality, no amount of hard work can meet the goal of producing a fully useful treaty in time for the conference in December. Working faster, in fact, would be counterproductive because slapdash fixes will make it harder to craft an effective, long-term strategy to slow global warming. Rather than a mad sprint, success in Copenhagen hinges on crafting a more realistic 'plan B'. Some negotiators are privately pondering the question of what to do if Copenhagen fails. Those debates must now happen in public — starting in the upcoming meeting in Bangkok, Thailand — while there is still time to sift the issues that can be settled by December from those that require a new strategy and more realistic deadlines at least two years away. Proponents of action on climate change should be asking themselves, when is it time to go to Plan B? I guess we now have the answer. UPDATE: 9/18, apparently Treasury has now released the material with the redacted passages unredacted. This week's tempest in the climate policy teapot involves a Freedom of Information request from the Competitive Enterprise Institute, a group opposed to action on climate change, which reveals previously-unseen documents from the U.S. Department of Treasury. Apparently the documents simply restate existing information and are in fact dated. Nonetheless, they have provoked an outcry among those opposed to action on climate change and the usual mudslinging. Setting aside the substantive issues, does anyone see any problems with the manner in which the information was released, as shown in the partial image of the document shown below (PDF)? Memo to politicians: if you have nothing to hide, then don't hide anything. The dispute between the US and Europe is over the way national carbon reduction targets would be counted. Europe has been pushing to retain structures and systems set up under the Kyoto protocol, the existing global treaty on climate change. US negotiators have told European counterparts that the Obama administration intends to sweep away almost all of the Kyoto architecture and replace it with a system of its own design. The issue is highly sensitive and European officials are reluctant to be seen to openly criticise the Obama administration, which they acknowledge has engaged with climate change in a way that President Bush refused to. But they fear the US move could sink efforts to agree a robust new treaty in Copenhagen. The US distanced itself from Kyoto under President Bush because it made no demands on China, and the treaty remains political poison in Washington. European negotiators knew the US would be reluctant to embrace Kyoto, but they hoped they would be able to use it as a foundation for a new agreement. If Kyoto is scrapped, it could take several years to negotiate a replacement framework, the source added, a delay that could strike a terminal blow at efforts to prevent dangerous climate change. "In Europe we want to build on Kyoto, but the US proposal would in effect kill it off. If we have to start from scratch then it all takes time. It could be 2015 or 2016 before something is in place, who knows." The goal for the climate conference in Copenhagen is to reach a deal that can actually be implemented, rather than agreeing on binding high targets for reducing carbon dioxide emissions, US Energy Secretary Steven Chu said Tuesday in Vienna. The United Nations' International Panel on Climate Change (IPCC) is calling for countries to make firm commitments to reduce emissions that cause global warming by 25 to 40 per cent below 1990 levels. "Let's not make that one particular time the be-all and end-all, and if it doesn't happen, oh, we are doomed," Chu told reporters in Vienna, where he was attending the International Atomic Energy Agency's annual general conference. Expect more trial balloons, pronouncements of negotiating doom and confusing reports in the months ahead. Are You a Climate Skeptic?! Can Climate Policy Survive Doubt? A Crass Relabeling or Robbing the Poor? Climate Forecasts "Out of Kilter"
A Few Reactions to 'The First 300 Days"
Does This Look Like Business as Usual?